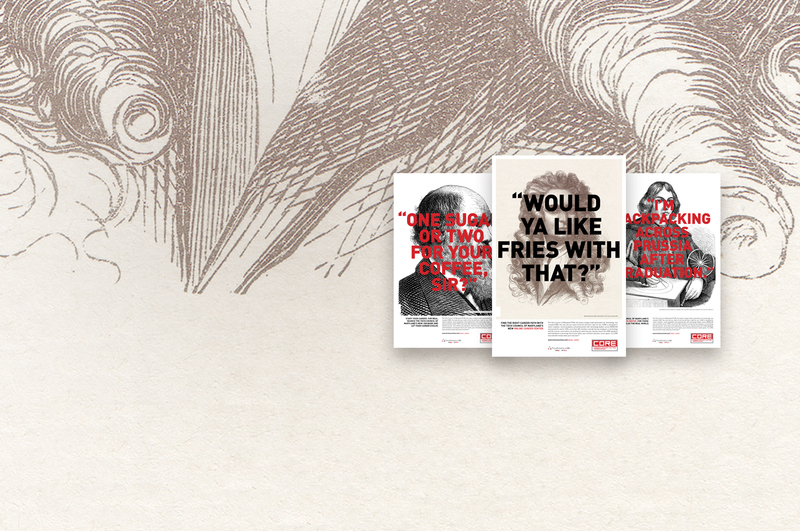 With the American Advertising Federation Baltimore Advertising Awards (Addy’s) just around the corner, we figured we’d take this time to show off the four projects that have netted us our five ADDY finalist nods. First on the docket, we have the following posters we developed for our client, the Tech Council of Maryland (TCM). They came to us with a project that involved branding and awareness support for their newest initiative, an online job bank for technology-related jobs in the area, aimed at engineering students starting their career search. Through initial conversations with the client, we came up with a name for the job board: Career Opportunities + Resources, (CORE). With the project officially named, now came the challenge of how exactly to get the word out about this truly vital job site. We’ve been fortunate enough to work with TCM for the past few years in a myriad of different marketing tactics and efforts; including brochures, e-blasts, illustrated logos, and other branding projects. For the first CORE-branded awareness tactic, we developed a brochure and sent it to local tech companies and recruiters, informing them of the CORE job board and asking them to post their opportunities and open positions to it – figuring, what good is a job board without jobs? After a few weeks, the board was full of postings just waiting for the right career-minded student to apply. This notion then played into our second marketing tactic. Because, what good is a job board if no one knows about it? Taking inspiration from the great work of Barbara Kruger, our Associate Creative Director, Pete Burch, came up with the following series of posters to post on college campuses and local-area watering holes around Maryland. 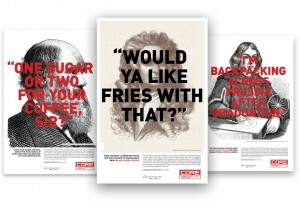 Utilizing strong, bold typography and irreverent headlines placed over imagery of math and science heroes throughout history – Copernicus, Darwin, and Newton – the CORE posters were created to resonate with the non-apathetic crowd that typically makes up these type of graduates. The poster series challenged these typically-passionate students to take their career searches seriously, teasing them with common phrasing they may start to hear if they were lax in their job aspirations. We had a great time working on this effort with our client partners over at Tech Council of MD and we encourage any math, science, or engineering students beginning to start their search to head to the job board. Interested in attending the Addy’s? Head here for tickets – we’ll sure be there. ← Hi. Welcome to Blog.